TUMI Startup Accelerator just held a pre- launch and orientation of six startups admitted into the mobility accelerator. The accelerator is set to solve Kenya’s mobility challenges. The new accelerator space is set to be officially launched on 24th January 2019 together with the CISCO incubation space. Speaking during the orientation, Dr. Tonny Omwansa, the Director of C4D Lab, said that the accelerator could be the solution to Kenya’s mobility challenges. C4D Lab is an incubation hub at the University of Nairobi in Kenya. It will house the accelerator in its space. The first cohort of startups admitted into the accelerator ranges from mobility services provision companies to web and mobile application based solutions. Think about this, millions of workers in Nairobi get stranded every morning going to work because of long queues and high cost of bus fare. In most cases there is always a minimum of ten people heading in the same direction. Ubabi Vanpooling society a startup admitted into the accelerator offers a vanpooling solution where people who go to work in locations close to each other and those who leave work at relatively the same time can vanpool to and from work. Autotruck E.A Limited is a green technology company that fabricates and locally assembles electric powered three-wheeler light duty cabs and handcarts. It is set to reduce harmful emissions into the environment while offering taxi services and light transportation in African cities. Inclusivity in mobility is one of the solutions the accelerator aims at solving. The admission of An Nisa Taxi, a cab company will see women get taxi services from women. The company offers safe and convenient services to women. It seeks to empower women with its drivers being women. This comes in the wake of reported assault cases against women by male taxi drivers. Just recently, Kenyans witnessed chaos in Nairobi after ‘matatus’ were banned entry into the central business district. Well, this was meant to reduce congestion within the city which is a good thing. The bad side was there were no alternatives for mass transit of people from the bus terminuses into and out of town. This saw millions of people walk long distances to their destinations while the disabled, children and pregnant women were left stranded. Sure corporation through its flagship service, Safiri Express will see such problems solved. Safiri Express offers safe, efficient, affordable and a reliable mass transit platform assuring security of movement for human capital at the working class & BOP level. Obaigo Delivery Network is an app and web based personal delivery solution. It gives users and commuters a new way to make money by making deliveries on trips they’re already taking around the city or upcountry. With the use of booths across the regions in the local towns, users who do not have smart phones are able to list their deliveries for available drivers on the way. Imagine you could have anything delivered to you including your pet! Through the partnership of C4D Lab, GIZ and UNHABITAT, the startups will undergo an acceleration journey at C4D Lab for five months beginning January 2019. They will receive coaching and mentorship from legal, mobility, marketing, risk assessment and evaluation experts. They are also set to get links with potential partners and investors including partners of the Transformative Urban Mobility Initiative. 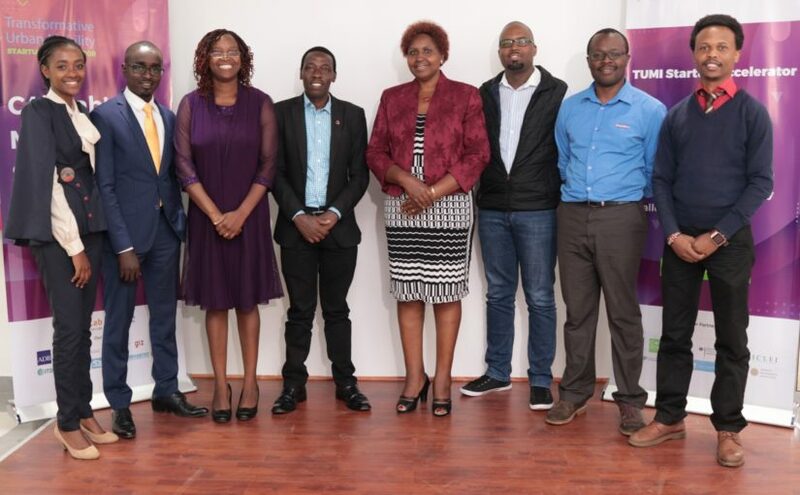 The startups will pitch and exhibit during the 5th edition of the Nairobi Innovation Week in June 2019 where they will get a chance to be discovered by sponsors and investors.